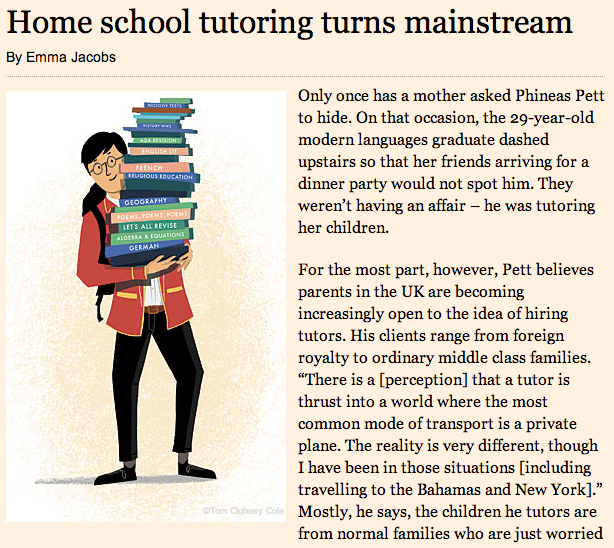 I was excited to be quoted in an article in today’s Financial Times entitled ‘Home school tutoring turns mainstream’. The article focuses on the use of Pupil Premium monies made available by the Government to Schools to improve the performance of children from less privileged backgrounds. Government funding for the Pupil Premium is now £900 per pupil for the year 2013-14, at a cost of £2.5bn. So what are the qualification criteria for the Pupil Premium? It covers those who have benefitted from Free School Meals (a population size of 1.6m) sometime in the last 6 years, those in care for over 6 months and the children of service personnel. 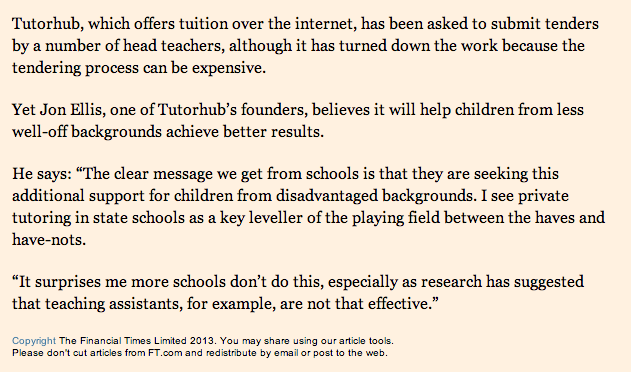 I was asked my opinion by Dorothy Lepkowska for my thoughts on the use of the Pupil Premium and whether we at Tutorhub had been asked by schools to provide online tutoring services direct to schools. It may come as no surprise that children from these backgrounds tend not to do so well at school. Comparing GCSE (A* to C, 2011-12) results of this group to the average, shows 42% passing versus 67%, an ‘attainment gap’ or shortfall of 25%. Lower levels of educational attainment are linked to low aspirations and future prospects. In my opinion, a clear focus on this group is important, if we are to see higher levels of attainment across the board and in those schools which traditionally struggle to get children through their education with decent grades. A controversial study by the Sutton Trust reported that most studies have consistently found that Teaching Assistants have a very small or no effects on attainment. Given this finding, it is somewhat surprising that schools continue to use money in this way. The picture for one to one tuition is different. The Sutton Trust also say that “pupils might improve by about 4 or 5 months during the programme”. Why isn’t this money being focused on providing hands on one to one tutoring help for disadvantaged pupils – £900 per pupil will still go along way.